The design of the 1 oz PAMP Suisse Lunar Snake Gold Bar makes this one of the most attention-getting gold bars on the market in year 2013. 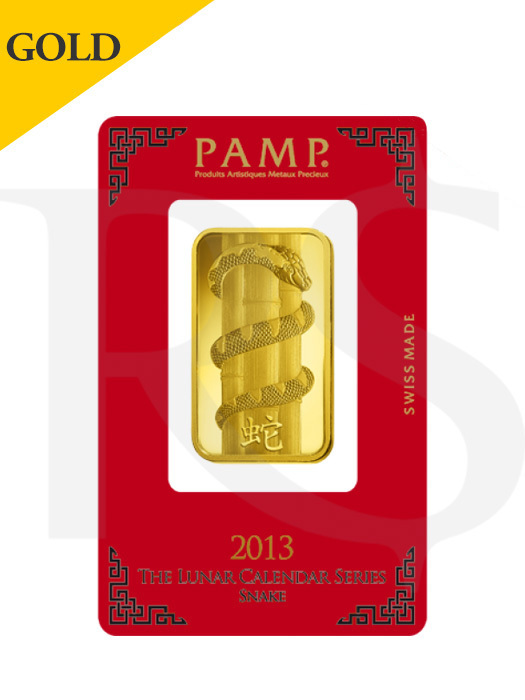 In celebration of the year of the snake, this gold bar’s design features a snake wrapped around bamboo. The gold ingot in the Lunar Snake PAMP range features an intricately charming design. The characteristics of a lunar snake are intelligence, intuition, and elegance. The reverse side of the bar continues the wrap-around design with exquisite artistry. The bar is also stamped with its one troy ounce of .9999 gold purity—an incredible level of gold refinement.